Six years after its original publication, New York Times bestseller The Untold History of the United States is re-released with an updated chapter picking up from where the original book and documentary film series left off. The book was written by American University History Professor Peter Kuznick in collaboration with Academy Award-winning director Oliver Stone. It’s the companion to the 10-hour Showtime documentary of the same name, and it details the rise and fall of the American Empire. The newest chapter “How the Unthinkable Became Thinkable Again” spans 2012 through January 2019, covering Obama’s second term, Trump’s first two years, climate change, nuclear winter, Korea, Russia, Iran, China, Libya, ISIS, Syria, and more. Kuznick and Stone challenge prevailing orthodoxies to reveal the dark truth about the rise and fall of American imperialism. Here, Kuznick talks about the major events that have shaped the world from 2012 through 2019. Why did you decide to update the book now? 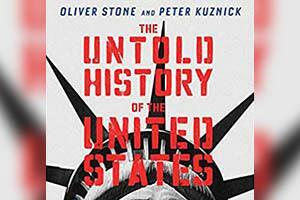 Oliver Stone and I decided to put out a new edition of The Untold History of the United States because we are both very troubled by how much more dangerous the world has become in the six-plus years since we published the original edition and began showing our 10-hour documentary film series on Showtime. Since then, the book, which was a New York Times bestseller, has been translated into nearly 20 languages, and the documentaries have aired around the world. We’ve published The Concise Untold History of the United States based on the documentary film scripts and the first two of four volumes of the young readers edition of the book. We also have a graphic novel version on the way. What did the world look like in 2012? In October 2012, the hands of the Bulletin of the Atomic Scientists' Doomsday Clock stood at 8 minutes before midnight. That was too close for comfort, but not as bad as it had been during the height of the Cold War. The US wars in Iraq and Afghanistan seemed to be winding down. Al Qaeda had been weakened by the killing of Osama bin Laden and ISIS had not yet emerged. A more peaceful world seemed to be at hand. On the negative side, however, the US-backed NATO bombing of Libya and ouster of Muammar Gaddafi had turned that country into a chaotic mess. And US operation Timber Sycamore combined with Bashar al-Assad's brutal response had helped convert a moribund uprising in Syria into the start of a bloodbath in which thousands had perished. What are the major events that have shaped the world since then? Now the world is in much more desperate straits than it was then. The danger of major conflagration is a real possibility in many parts of the world. US-Russian and US-Chinese relations are worse than they have been in decades. The US response to a resurgent Russia has in many cases been wrongheaded. Despite promises given by top officials in the US, Britain, France, and West Germany that NATO would not expand "one inch" to the East in 1990, NATO has expanded 13 countries to the East right up to Russia's doorstep. This has created a very dangerous standoff, the consequences of which we can see in Ukraine, Crimea, and Eastern Europe today. Tensions have risen on the nuclear front as well. A little more than a year ago, Vladimir Putin announced that Russia had developed five new nuclear weapons, all of which, he claimed, can circumvent US missile defenses. The US 2018 Nuclear Posture Review elevates the role of nuclear weapons and calls for development of new smaller nuclear weapons that would be more useable. The US had already begun a 30-year nuclear modernization process that is now estimated to cost $1.7 trillion and whose goal is ultimately, again, to make the nuclear weapons more useable. As a result of the general worsening of relations, nuclear modernization across the globe, tensions with Iran and North Korea, renewed conflict between nuclear-armed India and Pakistan, a half million dead in Syria, and failure to seriously address the potentially cataclysmic ravages of climate change, the Bulletin's nuclear experts have moved the hands of the Doomsday Clock to an ominous 2 minutes before midnight, which equals the closest it has ever stood in the more than seven decades of the clock's existence. If that doesn't scare the you-know-what out of people and motivate them to take action, I don't know what will. On top of that, we have the heightened tensions between the US and China over a number of issues. China maintains its inflexible stance in the South China Sea and the US, with its freedom of navigation operations on top of its Asia "pivot," is itching for a confrontation and has come very close to provoking one. The US-backed Saudi assault on Yemen has created a humanitarian catastrophe. And the possibility of a US attack on Iran is back on the agenda. And still further, we have the rise of intolerant and deeply oppressive right-wing, military-backed governments across Latin America and Europe, the victory of Netanyahu in Israel, and the ascendancy of Donald Trump's brand of bigoted, despotic and Constitution-threatening rule in the United States. So, there is much to be worried about. Yes, there's a lot to be worried about. Oliver Stone and I have put it all together in our nearly book-length addition to the original volume as a warning and a wakeup call. When the world is in dire circumstances, it is the responsibility of public intellectuals and artists to shine a light on what is occurring and try to arouse awareness, indignation, and action. That's what Oliver Stone and I have attempted to do in our new edition of Untold History and in our new piece in the Nation. I hope people read them both and heed our warnings before it is too late. The opinions expressed in the text belong solely to the author.